The 600B forged irons give a clean, classic set up at address. The beveled tour trailing edge gives supreme playability from a variety of turf conditions. 600B iron heads can be combined with the 600C (#SE2661) set at any point. Many players will choose to play the long and middle irons from the 600C set and then use the short irons from the 600B set. The head sizes, offsets, weights and topline appearance all match up well with one another no matter where the sets are combined. This my fourth review of clubs and it seems I find a better club each time. 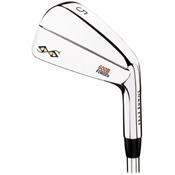 My previous reviews were on Snake Eyes FMC-1, Snake Eyes 600C (Cavity Back) and GolfSmith Pro Forged blades. All the clubs I like and still own but the Snake Eyes 600B (Blades) are the best. I thought the GS blades were good having never it a blade before but the SE 600B blades are even better. They have tremendous feel and for a blade, I found them for giving. This post is after only playing two rounds with them but I can tell, they are for real. My first round was an 82, my second was a 77. They have a VERY solid feel on well stuck shots but aren't harsh on miss hits, the GS blades were. They have so much feel that the Pro V1 balls I've used for years feel hard, switched to the Taylormade Penta TP5 but that's another review after this one. Like I said, I've only hit two brands of blades so there maybe better ones out there but the Snake Eyes 600B are a GREAT club!! Golf Smith Pro Forged blades. I cannot believe how hard everyone had made out blades to be to hit, so i decided what the heck give them a try and no it's complete rubbish not as hard to hit as made out; although you obviously need to be able to hit the ball reasonably well to get them at the right trajectory and distance, hit them reasonably well and you have a great shot flying off the face of the club. i found they are very workable so when the wind is strong they are very controllable and when you want a draw or a fade they will provide that. However--- they will pull and slice as they are so workable if you hit them that way. also they sit down extremely quick and you will sometimes find some check and backspin depending on how you hit them. as i say my results! throughout the last 4 days i have had 4 rounds the first round with them was just about getting a feel for the clubs i shot 2 over my handicap and the conditions were very wet and windy. the second round was medal and i shot 1 under my handicap again in wet conditions. The third round i played matchplay with my friends and won 2 up in wet conduitons on a few tempary greens and my final round today was the monthly stableford in harsh winds and wet conditions, i the frontt 9 badly with a blob and many tops with a hybrid im tryin (15 points) back 9 I finished with 23 points ironswere superb finished 2 under and won the competion! SO HONESTLY SOME GREAT IRONS HERE. GIVE BLADES A TRY DONT LISTEN TO WHAT EVERYONE SAYS ABOUT BLADES! YOU DONT HAVE TO BE OFF SCARATCH TO USE THEM IF YOU HAVE AGOOD CLEAN BALL STRIKE THEN WHY NOT! I have been playing golf for last 1 year and hacked for the previous three and started in my late twenties. Having switched from a decent level racquetball, it took a while for the idea of hitting down and only slightly punching a golf ball to make it explodeto sink in. It is a slow grind-process with few -Aha moments that disapper frustratingly the next day. Now I have the 3/4 soft punch swing-yet ball taking off like it has an engine of its own-sort off swing (ofcourse there are days and then there are days). Don't have much off a short game yet to be able to score better. Next two seasons will hopefully change that. Having said that I was initially attracted solely to this blades no-nonsense-yet Nike/Mizuno blades like sleek looks and not much more other than I wanted to feel and look cool (Hard rock music blaring in the background). In last two years I have demoed a few big name blades out there (Mizuno -MP 32, 33, 14, 67) , Cleveland CG1, Nikes, Apex. I will not go overboard in praising the 600B over any of the others, but I will tell you there is no difference in the amount of energy these clubs will impart to the ball compared to the others. A club-face center or maybe slightly heel favouring center hit will send a feeling of slow motion ball compression through your entire body, which has proven life altering experience for some. Ball-flight, trajectory, spin, distance are things that are individualized to type of swing, but they will do anything just as well the other blades will do. Off-center hits may or may not be forgiving depending how square the club-face is at the moment of impact. And yes there is some truth in my opinion to the fact that blades force you to concentrate on the quality (center face hit, ball compression) rather than speed and power. I actually use impact tape to track my contact zone on the face. Only proper ball compression can give you the true value of blade irons. (Some 'players' cavity back will do the same, but then they require quality shots too). Buy them for they are a great value ($300-$600 cheaper overall than bigger names), have patience (lots and lots of it for a couple of years if you are starting out) and hit with a lot of belief and half punch-swings. Scoring I believe is a different art not related too much to the kind of clubs you use but controlled shot-making is a lethal weapon and get you there quicker than other factors. Golfsmith customer service is OK. I get personal attention from some of the guys at the store. Other's are indifferent. Never bad though. I'm writing a review on the Snake Eyes 600B and the 600C irons. I had a gentlemen in Texas build me a custom set of these irons. With the 2-5 iron being 600C (Cavity Back) and the 6-PW 600B (Blade). 1. Very Weak lofted (Normal 2 iron these days is 18, mine is 20. 2. Has nothing to do with these specific irons, but all forged irons, they scratch and dent SUPER EASY. Though the Cons are real cons, they are what I thought you should know. I have the irons fit with Project X 6.5 shafts, 2* Flat and 1/2'' short. I can honestly say I will never ever give into the hype of BIG NAME brand equipment anymore. These irons are simply the nicest looking, cleanest looking, and most fun irons to play. You think those Mizunos or Titleists you play are soft, hit these irons. Now, I can't stress enough the importance of getting clubs custom fit. Buying standard length, lie and loft clubs is only going to hurt you. It can NEVER hurt to get fit. Also, I want to say that if you don't think you are good enough to hit blades, you need to give them a try. They are easier to hit out of the rough and if you are in trouble a lot, they are super easy to work the ball out of tough spots. And the trajectory control is awesome! I played Mizuno MP 32's last season with S300 Shafts. Thought I would stick with thsoe forever, till I got hooked up with this club fitter in Texas. He convinced to let him make me a set. I'm glad I did. These irons are simply the best irons I have hit in a while. If you have any questions about the irons or the guy who fit me, please email me at SHodge2@mac.com! I'll answer all your quetsions. These are very nice and forgiving clubs (if that is possible with blades). I never thought I could hit these consistent being they are smaller than most cavity backs. The set up on these is perfect. You line up the clubs very easy. With technology growing so much blades are easier to hit than ever. I'm glad people still feel they are hard though. I picked up this set from a golf shop in dallas. My friend works there so I get heads up when super deals come in. Some poor soul sold them after not even playing with them once. Each club maybe had 5 swings on it. Not sure what he got but he had to get robbed cause I got the set for $125. The heads are $30 each. They are outfitted in royal precision rifle shafts. What a delite for me. Had him adjust the lie and specs for me and walked out the door only spending $150 for everything lie and all. Don't be fulled by any club that they say is hard to hit. get the lies adjusted and you will be hitting more in the center than what you think. in the same breath though, a poor swing is a poor swing. everything you can think off. i swing them all. These are by far the best forged blades that I have ever hit.I am 16 years old. Before I bought these irons I was playing off a 9-hcp.I thought that they would take my game to the next level.And I can assure you that they have because I am now playing off a 5-hcp and getting better every time I go out to play.These clubs are sleek and clean to look at.I found That they offer great feel and touch and my ability to manoeuvre the ball has greatly improved.I do suggest that you get fitted for these clubs as that can change the performance of the clubs.I have them with True Temper Dynamic Gold S300 shafts and they have a wonderful piercing flight into the wind.These clubs also come at a very affordable price,so you can't go wrong.I have also tried the Titleist 690's and the 695's and I found that they flew too high and balooned into the wind.The snake eyes also look more welcoming than some other blades.The top line on the snake eyes is the perfect size and I found that the top line on the Titleist was thin and even scary on the 3-iron.The snake eyes irons are made for good players,but having said that I think that they are unbelievably forgiving.I tried Mizuno MP33's and MP37's also they were too bettery and soft for me and the Titleist irons were too hard with not enough feel but the snake eyes are perfect because they are somewhere in between.They are an outstanding buy! I ordered the heads from GolfSmith and I found that they were very efficient and quick. Bought 7-pw in the 600b and mixed them with 600c in my 4-6. Installed 6.0 steel rifle shafts. The clubs are visually very appealing if you like a thin top line and classic head shape. Very solid feeling, and although you can feel mis-hits right away, I still feel like they are on the forgiving side. I've mostly played muscleback blades and really think the so called 'forgiveness' of huge cavity backs is highly overated. If you are looking at mizuno,nike,titleist or any other major brand blades defintley consider these first. To me the 600b & 600c are almost identical, in the end the only difference is probably psycological, so play whichever one you like the looks of. Ordered these online from golfsmith, and everything came as ordered. Clubheads were fine, but I did have a problem with the shafts, the tip on two of them was too large to fit into the clubheads, at first I thought I was doing something wrong but I took them to a clubmaker shop and they agreed that they were faulty shafts. (They also said that this is a common problem with rifle brand shafts.) It was a major hassle to return and get the correct shafts. Would not order shafts from golfsmith again. I also bought the 600w wedges in the black 'rust' finish- 52,56,60 degree. Once again, they are visually stunning if you like a classic head shape. Love the finish-slowly wears out and only rusts a little. I defintley spin the ball more with these than my previous taylor made rac wedges. lovely looking set of irons, added 2 iron and 56 degree lob wedge (oil can)to set. Found the irons from 7 down to pw to balloon, i have a very high flight generally but found these clubs lost all distance for me.